In this column I will dive into times, throughout superhero history, that comics got political. There seems to be a constant debate if political discussion has a place in the medium. I hope to show that politics and superhero comics go together. This time we take a look at the war on drugs and addiction via Green Lantern, Green Arrow and Speedy in Green Lantern issues #85-86. We have covered the Green Lantern/Green Arrow team up before, and how comics have dealt with drug issues as well. 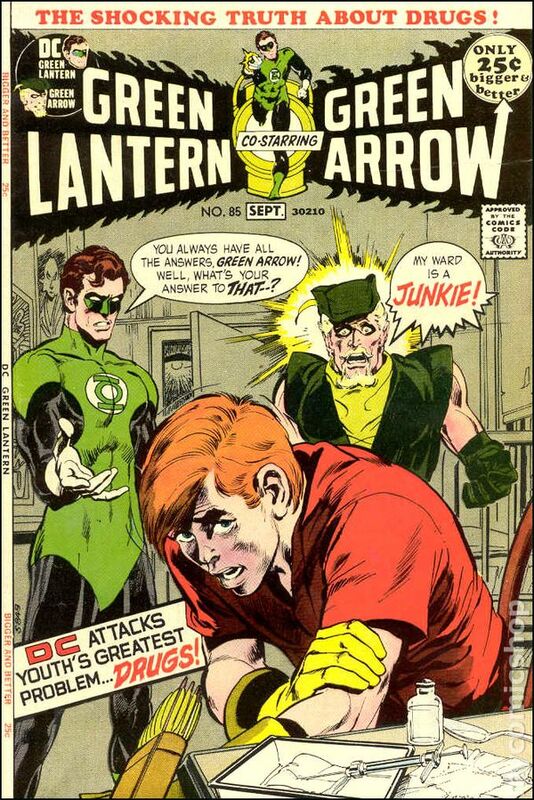 As previously stated the Lantern and Arrow comics tackled social issues that were contemporary problems. While “centrism” is a dirty word now, Denny O’Neil and Neal Adams actually did look at issues through multiple valid sides of the arguments. And, when they did bring up thoughts and sentiments that they felt were invalid they would discredit them. While the last time we looked at this series the heroes were tackling greed and land ownership, now they bring it to the streets again dissecting drug and addiction problems. The main thesis of this issue is that the drug problem stems directly from ignoring those in need. Every single addict in the comic comes to drugs through a moment of desperation, finding comfort in something when life offers them none. The creative team here does a great job showing the symbolic meaning of this in the opening pages. Green Arrow is shot with an arrow by a couple of low-level street thugs (who come back later). While he is bleeding and hurt on the street he is ignored. The people who pass him by are clear allegories to the same type of people who ignore the issues with drugs and poverty in society. First, an obviously wealthy couple ignores him and walks by. They do not want to lower themselves into helping someone who seems poor and in need. Then a police officer assumes Green Arrow in on the floor either high or drunk. He tells him to “sleep it off” rather than see if he could help in any way. It is only after physically collapsing in an emergency room that anyone takes notice of him. I do not feel that this is a stretch to transpose these ideas on the larger drug issue explored later in the comic. The rich typically see addiction and drug use as a problem the poor face. They do not have to deal with it on a day to day basis and can easily walk over the problem and move on. I do know that drugs affect everyone, rich and poor, but this stereotyped behavior has been evident in society and multiple forms of media. The police officer’s response is more direct in telling him to “sleep it off.” The officer sees him as an addict of some kind and refuses to help, leaving him on the sidewalk. It is clear that this is a message directed at the law enforcement of the day. They are seen as ignoring the issue and refusing to help, causing far more harm than good. The irony in Green Arrow’s opening pages is how he reacts to the drug problems on the streets himself. He makes it clear he does not understand how anyone can turn to drugs. He even ignores pleas of help from Speedy. Before Speedy confesses to being a drug addict himself, he tells a story of how someone could turn to drug use. The story is a deeply personal one for him and outlines how Speedy felt ignored and cast aside and then turned to drugs to find comfort in his depressive state. Arrow is too dense to realize that the story is true and simply tells speedy that he has no remorse at all for anyone who turns to addiction. Unlike the last time we looked at Green Arrow and Green Lantern, it is the Green Lantern who looks at the issues surrounding drug use objectively and with care and Arrow who handles it emotionally. While they both want to help Green Lantern sees the addicts as victims and Arrow sees them as criminals. There are three addicts in this issue and all three are written in a way to, hopefully, cause sympathy and empathy for the reader. The cast of addicts are diverse, and I believe this is done on purpose. O’Neil and Adams do not want to paint drugs as an issue that is part of one culture or race, which is often the problem in media at the time. We have Speedy who is care of Oliver Queen, Green Arrow, and is white and has access to wealth. The other two addicts are Asian and Black. Both come to drugs for different reasons. Both of them face racism in their lives and admit to the dehumanizing nature of having slurs thrown against them is what led them to drugs. No one actually enjoys being a drug user, and nothing about it is glorified in anyway. They all admit they are stuck in a trap and they hate the pushers as much as anyone else. The way the creative team deals with withdrawal paints a clear picture, that it is not easy to get off drugs once you are on them. The pushers themselves are overwhelmingly white and seem wealthy. Again, showing the power structure in society of those on top making sure that those at the bottom stay down. In the end, Speedy is able to control his addiction with the help of Hal Jordan and Dinah, who are the only characters who attempt to understand what Speedy is going through. Providing a clear message that outreach, help, and understanding are the only ways to take on the addiction issues. And, it is far more important to fight the issue from the top (taking on pushers and people who prey on the weak) rather than punish the victims of drug use. A fairy progressive and understanding message that would not promote the idea of incarcerating those in need.